Welcome to the thread to support my 2nd attempt at a mask. 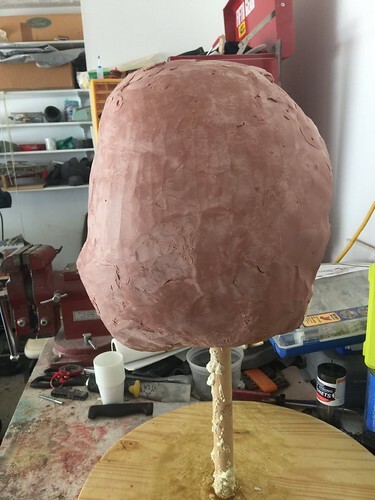 my first was killed off due to my own mistake in the type of clay I used not being usable with the silcone I was trying to use for the mold. So thanks to none cure the old sculpt got ruined and was not usable at all. 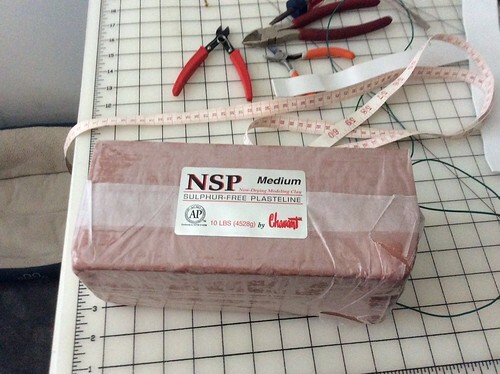 thanks to a fellow Kig I now have some good Sulfur free clay to use. 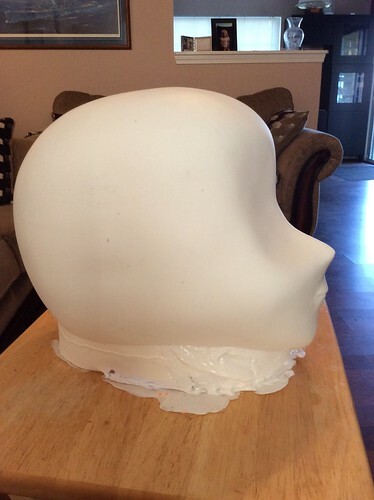 So to start off the new sculpt I got a new Styrofoam head and then built a base to set it on. 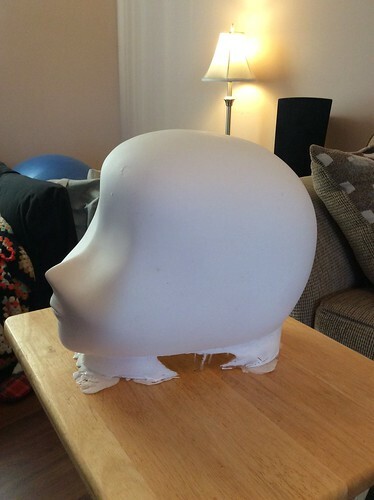 Once that was done I took the time to slowly build up the size of the head with some greatstuff ( an expansion foam used in houses to seal off windows and such). 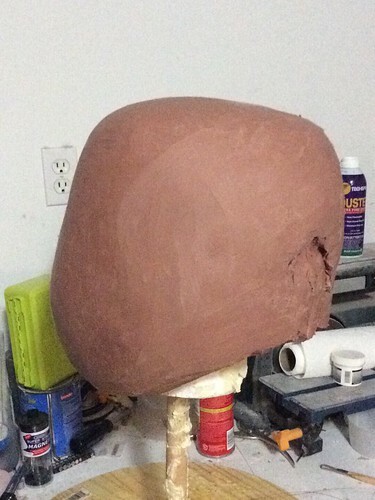 Finally I shaped the foam to a very rough shape of what I needed and started adding the clay. 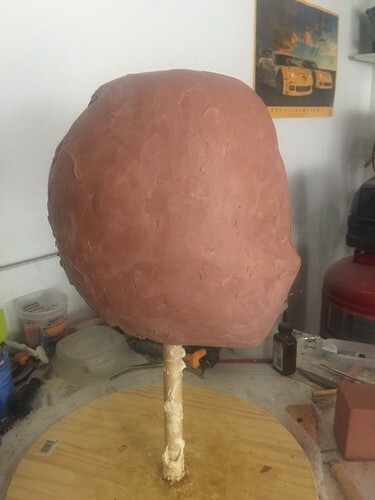 one of the keys in working with this clay is to warm it up so it is malleable and softer for you. 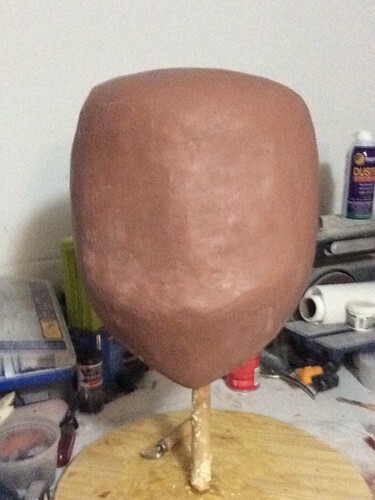 So from there I took time building up the clay and as I did so I begun to add shape I wanted to the clay. 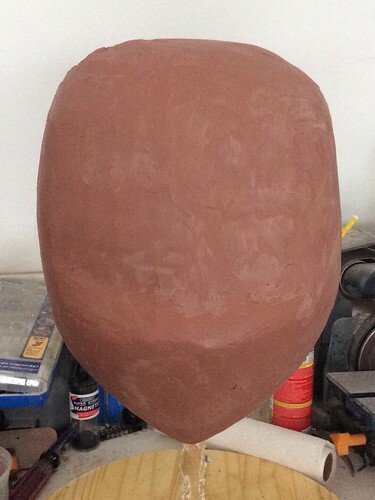 So I spent a good week or two on and off working with the clay adding to the coverage and working on the symmetry of it. Still got a ways to go on symmetry but I am finally seeing the right feel to the mask. 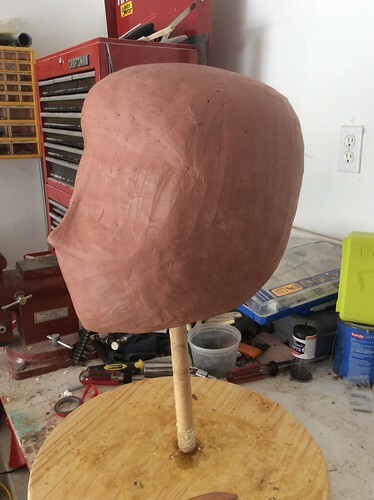 So for now the work on getting all the coverage and symmetry I want is still happening, but I am getting closer to starting to add details like the jaw line, cheek line and nose areas to the sculpt soon. 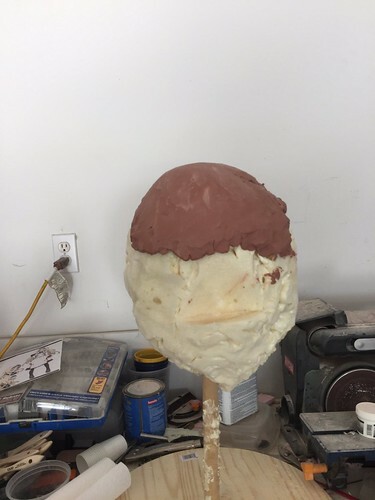 Later will be a mouth and even a defined area for the eyes. I will be posting updates to my twitter twitter.com/RavenOcelot_kig and into my Flickr flickr.com/photos/ragresen/sets/72157683179701624. I hope that folks will ask questions as I have learned much since my last thread and attempt and to those who have given input please feel free again to add your thoughts. 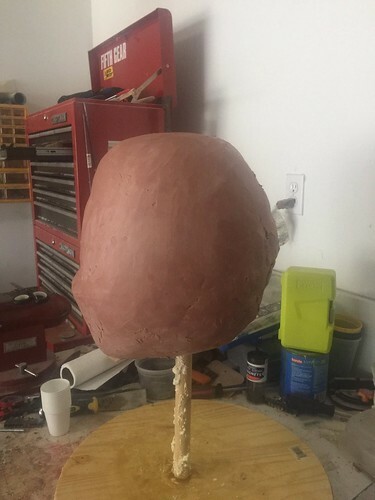 So just about used up all the clay I have so far and have been fighting an issue I did not expect. 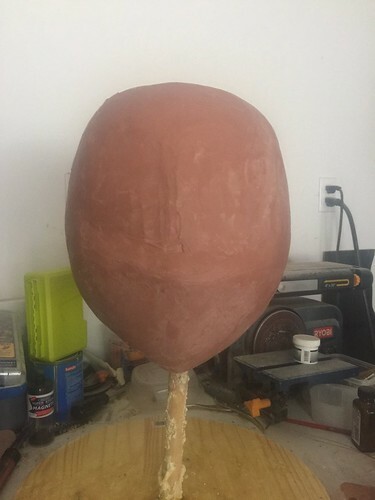 it seems the clay is not sticking in place to the foam I am applying it to. 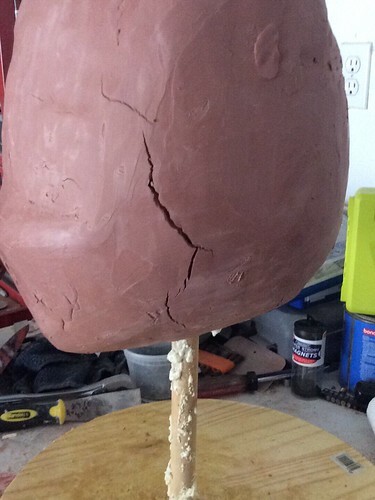 As a result i am having issues of sections of the sculpt starting to develop cracks from heat in the garage and gravity then pulling the loose parts down. I am trying right now to see if compressing the clay better in the areas of the cracks will start to relieve the issue. Soon more clay will need to be bought. Also this is just some progress work I have made post an attempt at repairs. Post was edited 1 time, last by “Raven Ocelot” ( Jul 23rd 2017, 4:20am ). 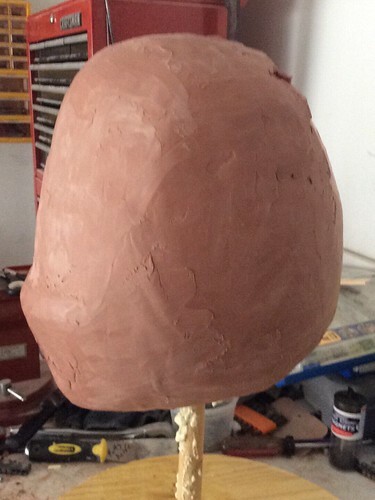 Well another update as I push through 10 lbs of more clay on my way to getting this all right. the symmetry is getting beteer as is getting the back side slowly complete. All in all I am feeling good about this right now. well here is more of an update. sometimes I feel I go backwards in the sculpt when correcting things. Well obviously I am in the part where a more talented artist would cruise through while I struggle to get what I want. The key is to keep at it. So the first coat is on and starting to sure. Second coat will be coming shortly. 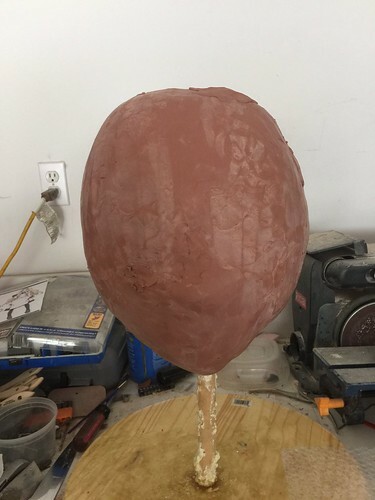 the real fun is once think enough I will get to then have real fun and create a two piece hard shell to support the silicone mold for casting. So kinda a big update from this last week is happening. 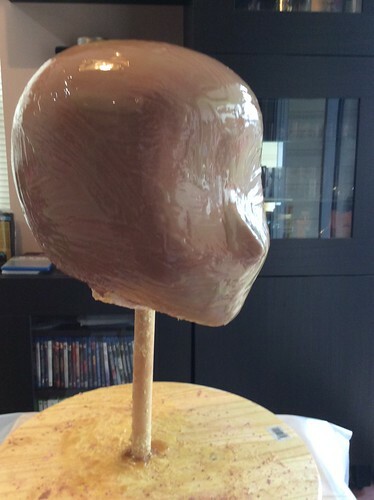 I completed the mold. 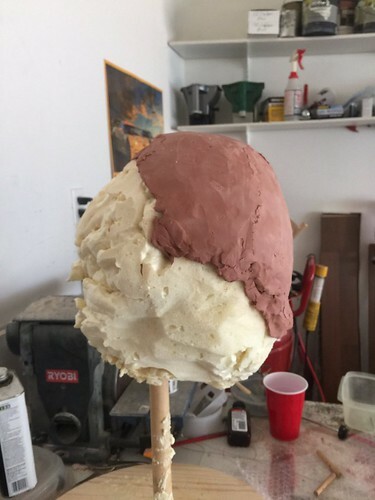 After going through several layers of silicone over the sculpt I let it cure for a good day and even added some knob keys to the outside of the silicone. Well once I got all the silicone cured it was time for the next stage. 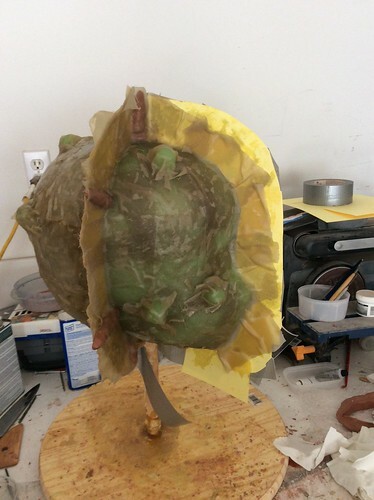 A hard outer shell or jacket is needing to be made. To do this I created a divider out of some old card stock I had laying about. 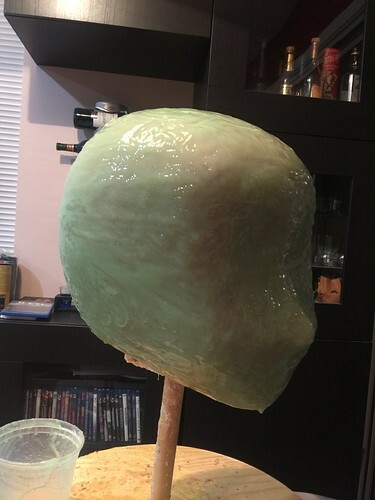 Once I had it held in place as best I could with some duct tape I then got to work with some Polyester Resin cause it is really cheep and an old bed sheet that I cut up. basically I used the resin to saturate the cotton bed sheet strips and started laying then over the silicone and against the dam or divider I made. I built up about 3 layers of this and let it cure. Once cured I then peeled off as much of the card stock as I could. 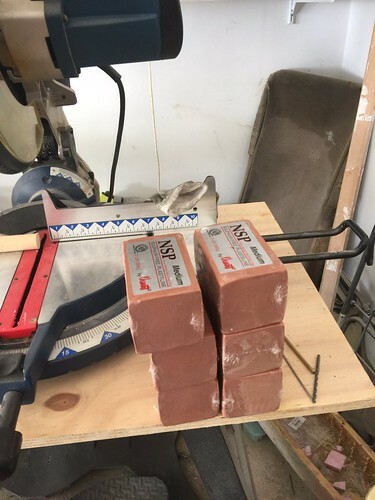 I grabbed some of the clay I had and built some small strips that I could later fit a screwdriver into. With the clay strips in place and another dam or divider to make the shell three pieces I then waxed up the existing shall piece where the next one will touch. Again I layed up about three layers of the resin soaked bed sheet to the area. Finally I had to do the third piece which again is a repeat of the steps from before. 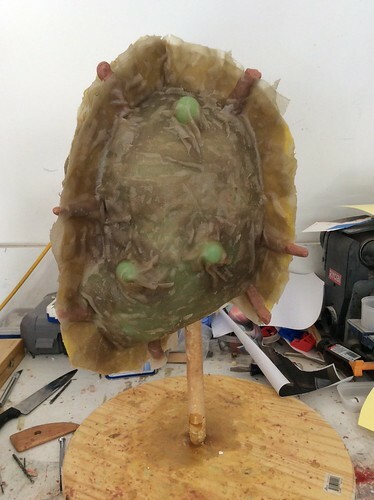 Once all this is cured up completely I drilled through the divides of each shell piece so I could later on bolt the entire shell back together. I actually found that when placing the silicone back into the shell it was wise to bolt the front two pieces and then lay in the silicone into the front lining up the keys and getting them seated fully. 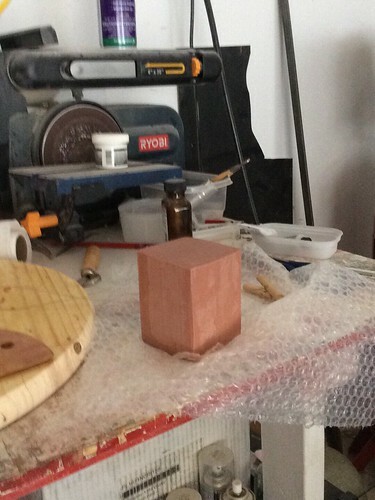 If you do not get the keys seated fully you will create a deformed area to your piece you will cast later. 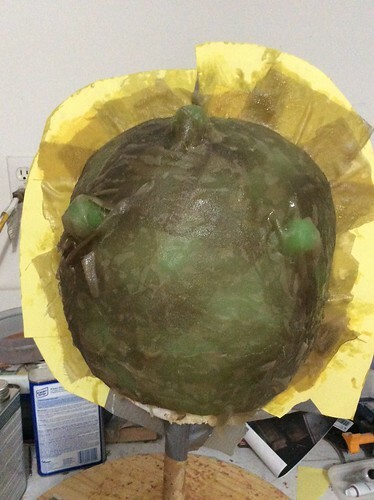 Last thing I did was open up the shell and then pull the silicone mold from the sculpt. 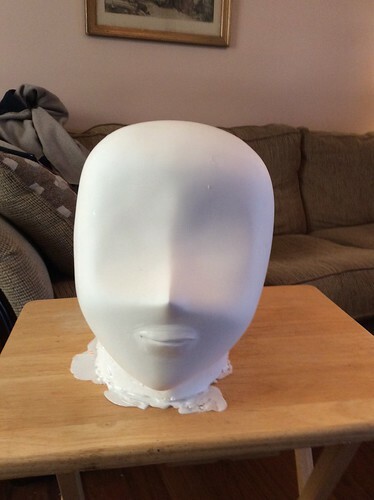 Well from here you need to clean up the mold of anything that is sticking to it you do not want in your casting. 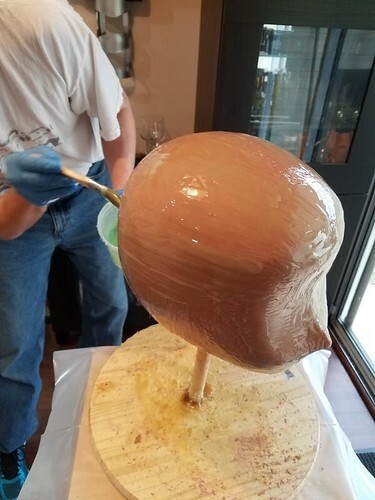 Once that is done it is on to casting. I know it has been a little while. Well made some progress that I had not updated over here. 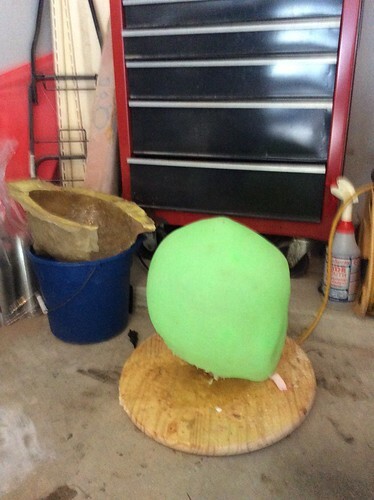 The mold got completed for the casting one I want to use. 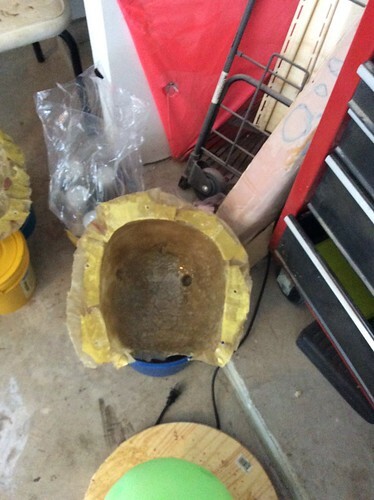 I cast the first piece from my mold today and thought I would share the raw casting pictures I took. 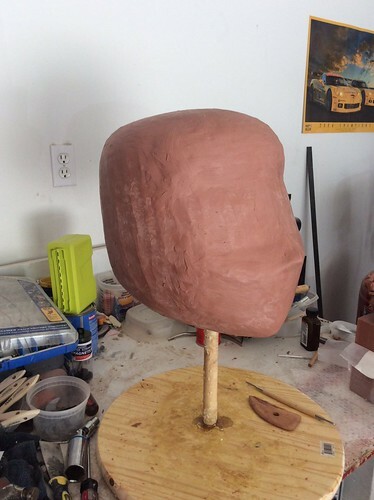 Well hope this inspires other working on their own masks. Minor clean up is next and then prepping for eyes and ears. Wery good progress. 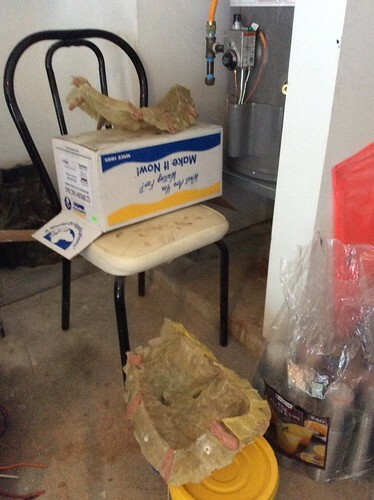 in DIY work, perseverance pays in the end. 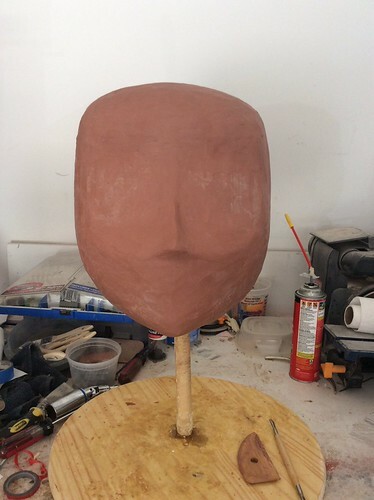 you're clearly very good at working with silicone/resin and finishing the clay but I can't help thinking that some of the proportions are off and i think it's kind of a shame you've already moulded/casted it, for example how big the nose is and how it's convex instead of concave towards the tip, there's only so much you can do now but I feel like if you really want to get an accurate representation of the character you should in all honesty re-visit the sculpting stage. 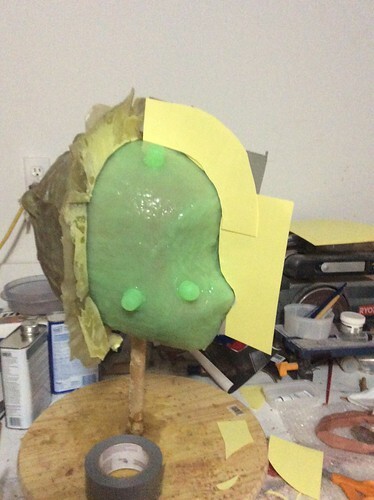 Honestly I moved forward with the mold and cast when I did because I did have a deadline. This is far from my last attempt at things and actually will only be making more. this is but a first for me and proof to anyone trying this that it is not simple.